Considering I've been following the Phoenix Coyotes some this season, I did enjoy watching their return to the Stanley Cup playoffs. 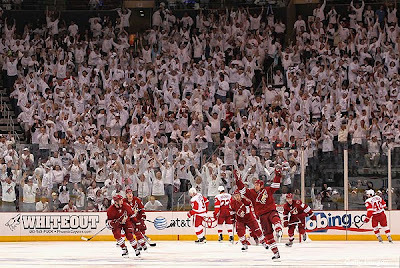 No matter what is currently happening with the soap opera that is the Coyotes ownership situation, a sellout crowd of (mostly) Coyotes fans did their part last night, filling the Jobing.com Arena with a the oh-so-popular whiteout. The atmosphere - a some 17,000 "loud and boisterous" fans packed the arena - had to have energized the upstart Coyotes, who beat the Detroit Red Wings 3-2 to take the opening game of the 7-game series. Derek Morris after scoring the 3rd period goal that gave the Coyotes the lead. 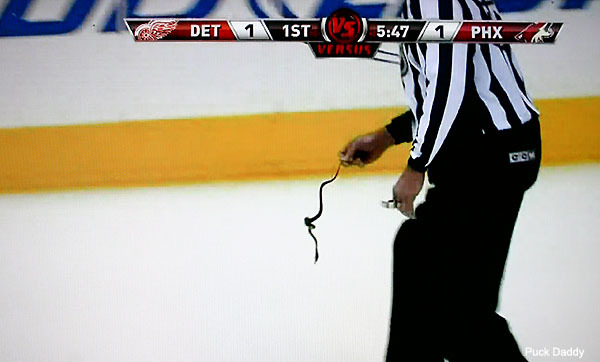 And yes, someone threw a rubber snake on the ice after the first Coyotes goal. It was only fair, however, as an octopi was thrown onto the ice during pre-game warm-ups. Small, but it's a start. As a polar opposite, earlier this week, the Baltimore Orioles played a game in Camden Yards in front of the smallest crowd in that ballpark's history: a paltry 9,129 fans. Those few in attendance could not have left happy, as they witnessed the O's drop a 5-1 decision to the Tampa Bay Rays to fall to 1-6 on the season. According to The Baltimore Sun, the crowd for that game on Monday was the first sub-10k attendance in 19 years of Camden Yards' existence. It's so small a number, that I hate to say the word crowd; I prefer "gathering." 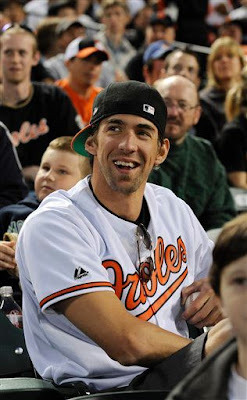 Phelps took in the game with a (very) few fellow Orioles' fans. The number was so pitiful that one Sun sportswriter felt it necessary to ask his readers whether Camden Yards "is still worth visiting." It's so small and so sad, that even USA Today has taken notice with the headline: "Hate Crowds? Go to Camden Yards." To put it in perspective, Monday night's gathering was the lowest attendance for any ballpark in MLB this season. Yes, that includes everyone's favorite MLB-punching bag, the attendance figures at PNC Park, home of the Pittsburgh Pirates. Even the lowly Pirates have yet to dip below the 10,000 fan mark at home this season. ...well, they just don't draw very well, period. After 12 straight losing seasons, even the players understand the fans aren't coming. For the Sun story, Kevin Millwood opined, "You've got to play good. If you will ballgames, they'll come." (As an FYI, Phoenix is a perfect example of how true that maxim is. 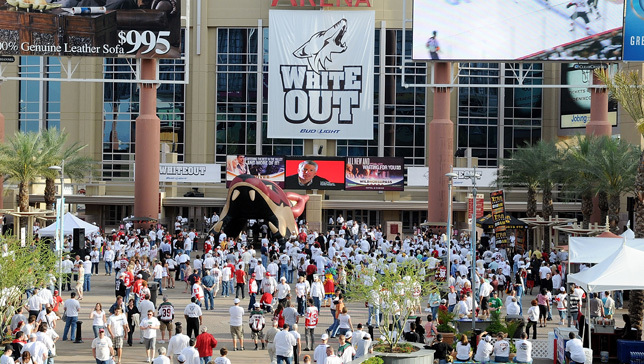 In early November, I blogged about a Coyotes home game that drew just under 6,000 fans). Let's hope so. After several seasons of continuous sell-outs in the 1990s (with season attendance figures averaging over 45,000 per game in 1997), Camden Yards has, sadly, fallen from grace. I can only hope that there are brighter days for O's fans ahead. Because unlike Joe Namath, I actually do care about the team strug-a-ling.